So little time...: Be More Jane Blog Tour ~ Guest Post, Deleted Scene & Giveaway! 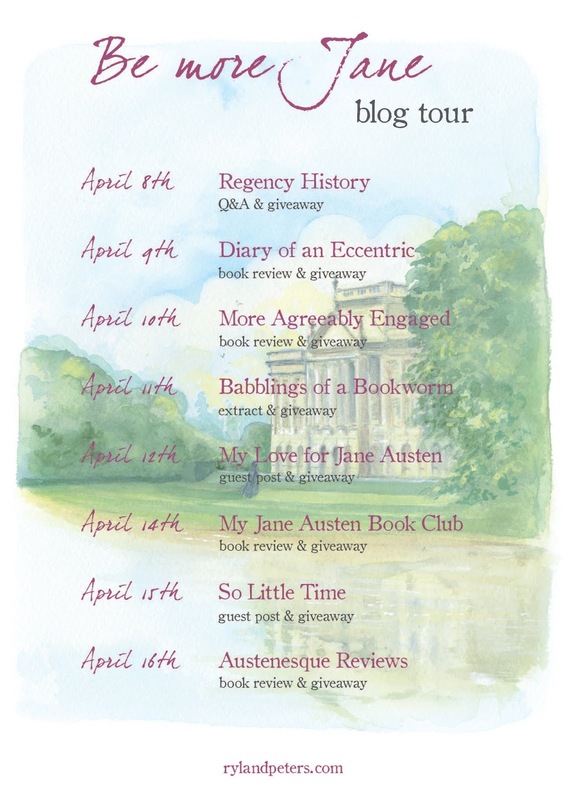 Be More Jane Blog Tour ~ Guest Post, Deleted Scene & Giveaway! Today it's my pleasure to have Sophie Andrews visiting with us here at So Little Time... with her new book Be More Jane! I'm very excited for Sophie! This is a cute little book that I'm sure many of you will enjoy! 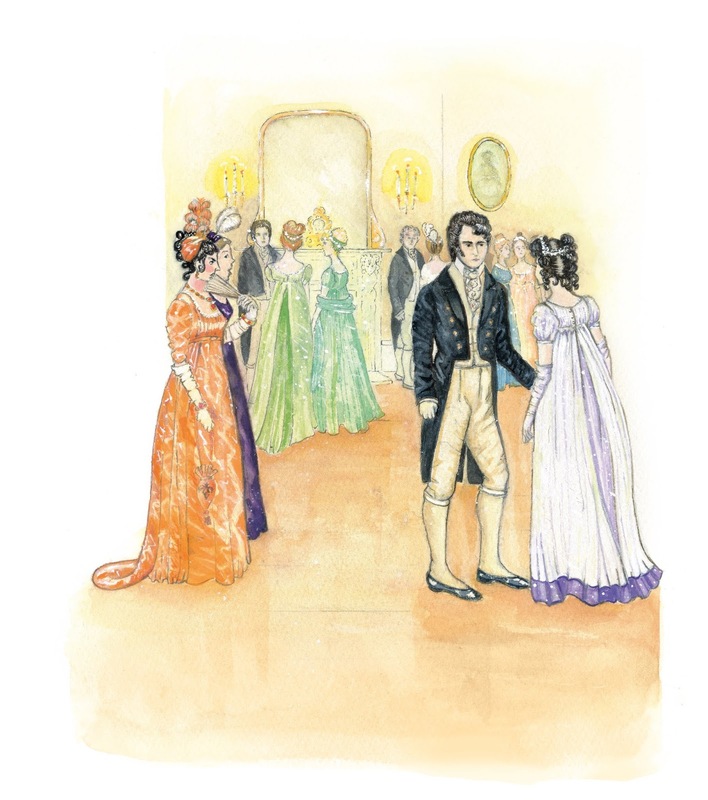 The illustrations are just beautiful, and you may recognize the artist Jane Odiwe; author of more than a few Austenesque stories herself! 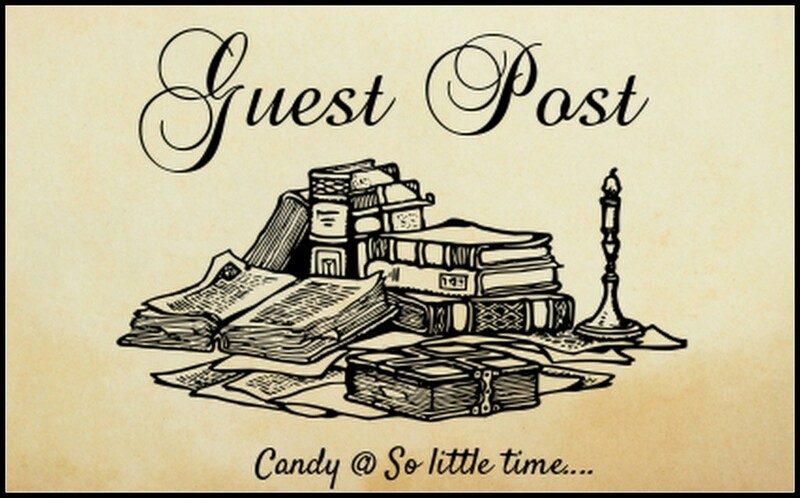 Sophie's sharing with us a deleted scene from Be More Jane, and CICO Books is giving away a copy of the book to one of my lucky readers! Details are at the bottom of the page. Thank you so much, Candy, for welcoming me to your blog today. Of course, throughout most of my new book, I share light-hearted but genuine advice; lessons I have learned from Jane Austen and her novels and letters. 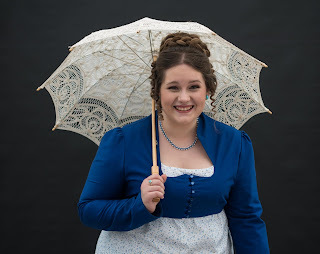 However, I have also had a little extra fun along the way, by writing as some of Austen's most beloved, often comic, characters - who mistakenly believe they have their own sensible advice to share! So today, I am excited to share with you something which didn't quite make it into the final book, (due to lack of space!). I was working to a page and word limit, and I had rather too much inspiration for some of my comic character sections, and a few had to be dropped. So today, I am delighted to share with you and your readers some advice from Mrs Augusta Elton. I have recently changed my name from Hawkins - and you will surely know of the Hawkins family, of Bath society? - to become Mrs Augusta Elton, and wife to the rector of a small and somewhat insignificant little village called Highbury, in Surrey. I cannot deny that Mr E comes from a prettyish sort of little place; after all, we have all heard that Surrey is the garden of England; yet it is all rather ‘countrified’ roundabout. Town is so much more diverting, sociable and modern, and being used to a most fashionable lifestyle in Bath before my marriage, I have had to adapt to the somewhat less.... well, civilised ways of the countryside. I am learning to retain as much style as is possible in such an ordinary place, and who knows, perhaps some of my neighbours may pick up some tips? However, I do feel obliged to share my advice with you, too, in case you have the misfortune to find yourself living in a similarly remote situation and in need of such assistance. • When first you are to be seen in your neighbourhood, I recommend you make an entrance. You must ensure people notice you have arrived, remember your arrival, and hopefully mention it to others. Word will soon circulate. You might elect to come suitably late to social gatherings; in fact, should you be the last to arrive, then everyone will have the opportunity to observe your entrance - it does seem to me that in the countryside, people are unfashionably fond of punctuality. • It almost goes without saying that you must have your husband acquire for you an elegant and modish means of transport. A lady must have a carriage at her complete disposal, to go calling in the afternoon, and to arrive at soirees and evening parties in the correct manner. Might I suggest the barouche-landau for real comfort? - a most fashionable choice, it cannot fail to impress. My darling sister Selina has one, and she says they fit four perfectly! • My next idea is to form a musical club. I absolutely cannot live without something of a musical society, indeed, without music, life would be a blank to me. Therefore do not be forced to give up such cultural activities upon leaving town, indeed, ladies of consequence in society should lead the way by organising such pursuits. • If there is to be a ball in the neighbourhood, - there is likely to be one held in your honour -, do be sure to supervise the arrangements, since you will doubtless have greater expertise in the organisation of fine occasions. Ensure that people are made aware that you, as guest of honour, must lead the first dance of the evening, since they will not know this is how it is done in Bath, and other popular towns. I would advise you against filling your dance card, despite the numerous gentlemen who will be seeking your favour, for you cannot possibly perform every dance at the ball with the same high degree of accomplishment. Nor should you be seen to be making yourself too obviously the centre of attention and admiration. • If an outdoor pursuit is to take place, (which is inevitable when one is in the countryside where there is little else to do), you must be dressed in an entirely appropriate manner, which may well require some new dress or pelisse. This is a good opportunity to show you are adapting to country life, whilst retaining your sense of stylish attire. We had the most pleasant day, strawberry picking on the estate of one of Mr E's dearest friends, Knightley, and I was quite pleased with my outfit for that occasion; I wore a straw bonnet, and had trimmed my basket with a pink ribbon. I considered riding on a donkey, which would have made for a noteworthy arrival. I really must talk to Mr E about purchasing a donkey, as I conceive it to be a sort of necessity for dusty country lanes. I do hope I have encouraged you to introduce some style to your little neighbourhood and to retain a sense of fashion, even if, like me and my caro sposo, your situation requires you to live in an unfamiliar and less important society. Thank you again, very much, for hosting me here today. I really hope you liked this little vignette, which didn't quite make the final edit, and that you all enjoy reading my new book, 'Be More Jane'. It's giveaway time! 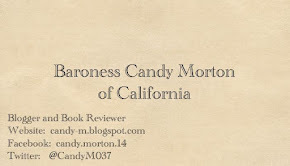 CICO Books is giving away a copy of Be More Jane to one of my US, Canada or European readers! To enter, fill out the Rafflecopter below! 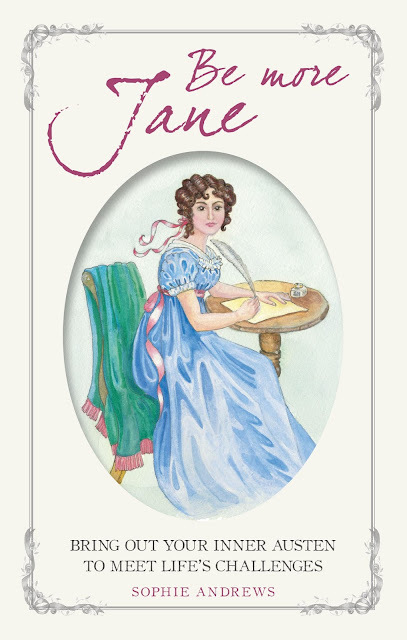 One person will win a copy of Be More Jane by Sophie Andrews. To enter the giveaway, fill out the Rafflecopter below. Open to US, Canada, or European readers. Last day to enter the giveaway is April 22, 2019, at 11:59 PM, Pacific Time. For more chances to win, please check out the other stops on this tour. Each site is giving away a copy of Be More Jane! A huge CONGRATULATIONS to Sophie Andrews on her book! 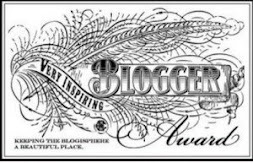 Also, I want to thank her for being a guest on my blog! Many thanks to CICO books for including me in this book tour and for the wonderful giveaway! So, friends, what do you think? Isn't there so much we can learn from Jane? What a lovely commentary from ever-verbose Mrs. Elton. She's a hoot! Oh, yes, she is! I enjoyed reading her advice. Mrs. E is not a bit full of herself at all! ;) LOL! Thanks for stopping by, Joy! Thank you. it was a shame there wasn't room for this one. but lots of funny one were included! What a hoot! I've always found Mrs. Elton a riot. Glad to get this 'cut' scene. Hey, Sophia Rose! Yes, she is a hoot! This scene was fun to read! Thanks for stopping by! Good luck! I hope you enjoy it too. It was fun to write! Thank you so much for joining my tour and I hope you enjoyed my deleted scene with the wonderful Mrs E! I hope you enjoy my book as well :) thanks again!